If I had a to pick my favorite quilt patterns, Squared Away would make the Top Ten list. I usually quilt this quilt with a Ribbon Candy quilting pattern, but my students challenged me to use any pattern BUT ribbon candy this time. Before I committed to quilting this entire quilt, I made some placemats as test pieces. I filmed how I quilted them. I used rulers on a home sewing machine in this video, but these designs can also be quilted with a longarm or a sit-down longarm machine. The fabric in my Squared Away quilt is Pat Sloan's Bobbins and Bits (and a few pieces from her other lines) and I adore it! I bought it at Quilting Possibilities in Forked River, NJ. I checked with Debbie and she definitely has more of this fabric in stock. Check it out. The thread is my FabuLux Mellow Yellow and InvisiFil Daffodil. They quilted like a DREAM! The first quilt I made with this fabric was Oh My Stars! I made a test block into a pillow. I still have fabric left and am piecing more quilts. I will show you as I finish them and will try to keep filming the machine quilting videos as I go along. Have you made any of these quilts? Have you used Pat Sloan's fabrics? Let me know in the comments! Acorn Valley by Patty Young -- Free Scarf Tutorial! Today is the day I get to tell you about the new fabric line that Patty Young of ModKid has designed for Riley Blake Designs! 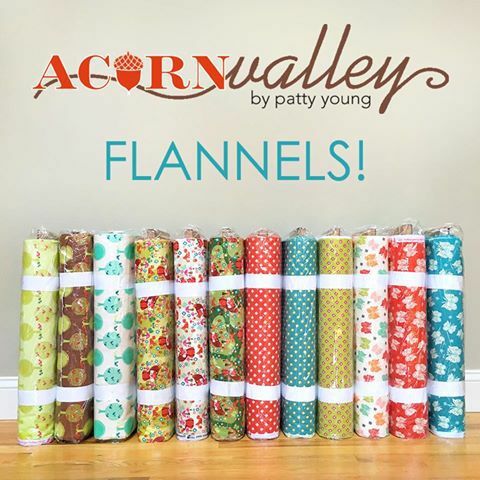 I picked some yummy flannels from Acorn Valley to make a scarf. It's blazing hot here in New York right now and most folks aren't thinking about winter scarves, but summer means something else to me. My immune system doesn't work very well and that means summer is a bit of a respite from the non-stop colds and flu that swirl around during the winter months. I don't want to hide at home, though, so I make and wear very long scarves whenever I venture out into public places. They look great and keep me warm, but that isn't the whole point. Every time I need to open a door, grab a railing, or push an elevator button, I use the bottom of my scarf instead of touching germy places with my hands. This might sound silly, but it totally helps! I throw the scarves in the washer and tumble dryer and make sure I have a clean one on every time I brave going in public. Press seams toward one color. I pressed toward the red (The Dark Side). There should be 32 strip sets. If you ended up with fewer sets, your very long scarf will only be slightly shorter. It's not a problem! From fabric C, cut a 10 1/2"x40" (width of fabric) strip. Sub-cut into two rectangles 10 1/2"x12 1/2". Stitch a rectangle to each short end of your checkerboard scarf. Fold this long scarf in half, right sides together, and stitch along the short ends and the very long edge, leaving about 10" open on the side for turning. Turn scarf right side out and hand-stitch the opening closed. Now put it away and enjoy the rest of the summer! Do you want a chance to win some of these very yummy flannels? Coupon code AcornValley2016 gets 25% off your entire purchase in the Modkid Etsy Store (https://www.etsy.com/shop/modkid). Valid July 11th through July 22nd at midnight EST. Sue O'Very is the other stop on the blog tour today. She has a Craftsy class on machine embroidery that I'm just DYING to take!!! Machine Quilting Tutorial -- No Ribbon Candy!!! Any quilter who has ever taken a class with me realizes that I love the ribbon candy machine quilting design. Like, a lot. A LOT! 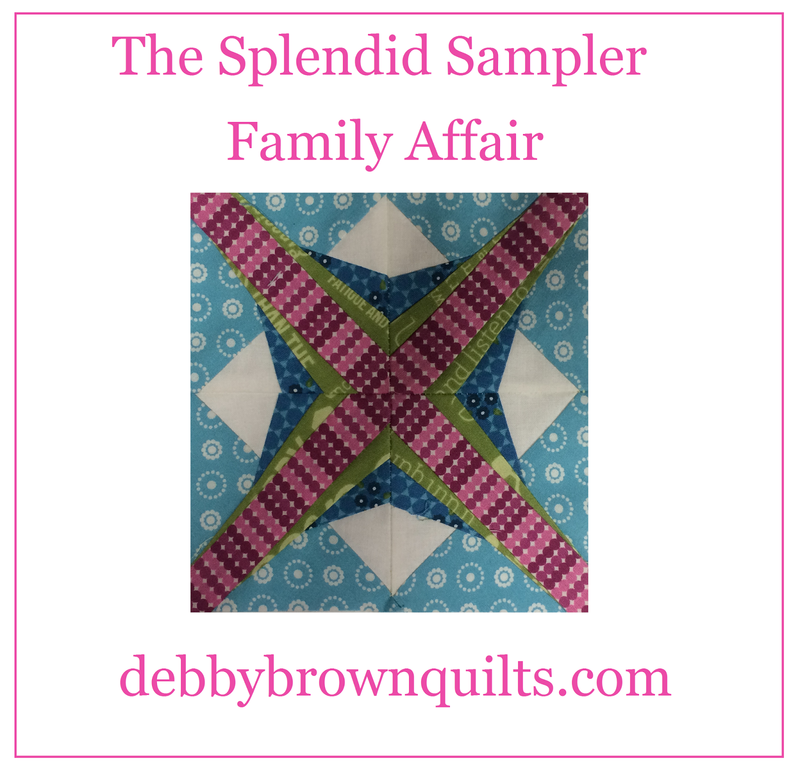 I have made many versions of my Squared Away quilt pattern and quilted each of them the same way -- with Ribbon Candy, all Ribbon Candy, and nothing but Ribbon Candy. Each one of these quilts was quilted with only ribbon candy! 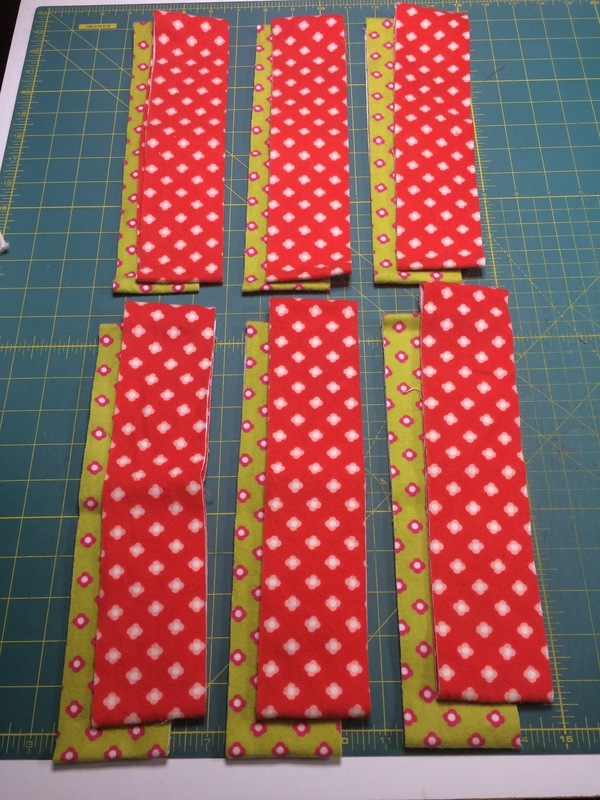 Some of my students double-dog dared me to quilt my Pat Sloan Bobbins and Bits Squared Away without using a stitch of ribbon candy and I couldn't back down! So, did you notice my new machine????? I am tickled pink to be quilting on a Handi Quilter Stitch 710 machine. She's a beauty! In the video I promised to link to a video on making a stencil. I scoured YouTube and couldn't find the video I thought was there. So Sorry! If you know of a video, post a link in the comments so others can find it, ok? In the video, I promised you links to the products I used. Some of these links are affiliate links for products I've paid for and use. If you click through my referral link, at no additional cost to you, I will earn a small commission if you make a purchase. Did you like my video? It is my hope that if you quilt on a longarm or a sit-down longarm machine, you will still find the video instructional. One of the most frequent questions I'm asked is about quilting with rulers on home sewing machines and I really wanted to show you how easy and fun that is! I am planning to film more videos about how to use different longarm quilting rulers. I have all of the Handi Quilter rulers -- is there one you'd like to see how to use? Now for the most important question: Do you prefer ribbon candy or swirls on the Squared Away quilt? I'm having a Splendid time catching up on my Splendid Sampler blocks. In the last week, I've survived paper piecing and teeny-tiny pieces. Pat Sloan's Lina's Gift block was a breath of fresh air! It had larger, simple pieces and went together quickly. I'm using April Rosenthal's Meadowbloom fabrics. She has a pink fabric that looks like basketweave and I fussy-cut one of the larger prints so there was a flower inside of the basket. Check out all of the beautiful Lina's Gift blocks HERE. I am tickled to be a part of the Acorn Vally Blog Tour celebrating Patty Young's new line of woodland inspired knits and flannels. Check out the fabrics HERE. I will be sharing my pattern and tutorial on Tuesday. While you are waiting, check out the rest of the stops on the blog tour. The designers have already shared so many darling projects I just have to make! Since my job means that I basically go to quilt shows for a living, avoiding these hobbies has been difficult. I walk by the wool booths and the Pro-Chem Dye booth at shows with my face covered, just so I won't be tempted the fall deeply in love with another hobby. My fingers are not itching from the wool, but they are itching to be stitching again! Yet another "I've never tried this" hobby has been struck from my increasingly short list. Oh Kimberly Jolly, what have you done to me??? 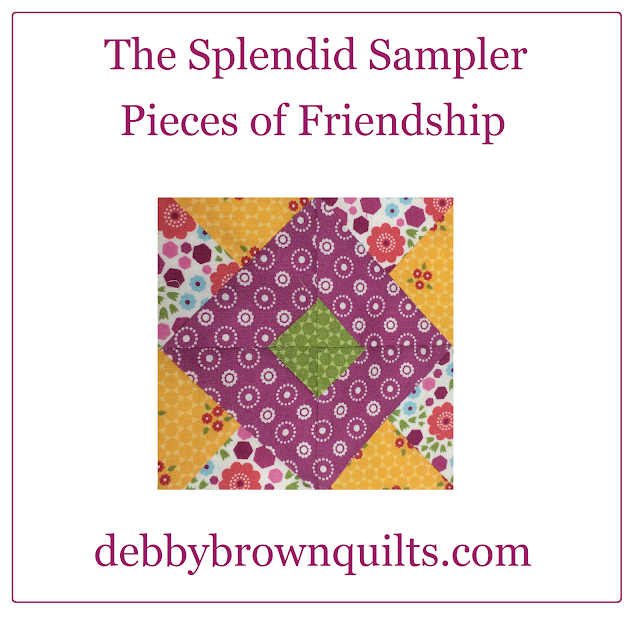 I was minding my own business, piecing the next Splendid Sampler block in my stack, and suddenly I was excited about piecing a 6-inch block that contained 55 separate pieces. How did this happen??? 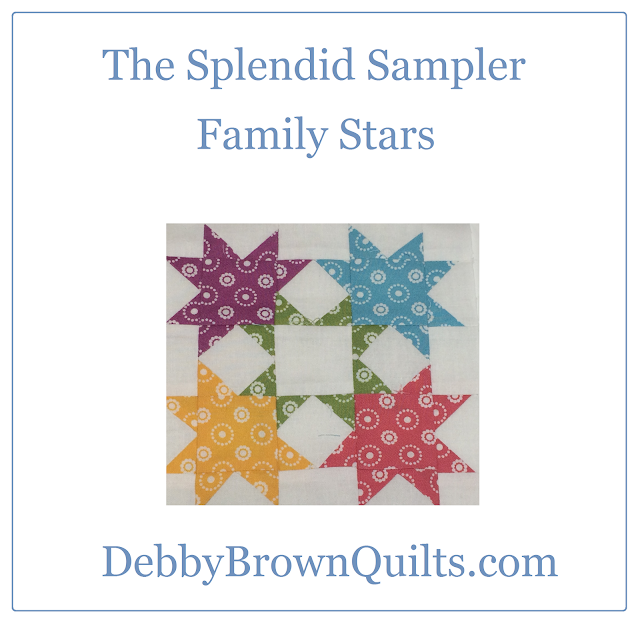 Click HERE and scroll down to see everyone else's awesome Family Stars blocks. So now I have accepted paper-piecing as an option for quilts and teeny tiny pieces made me smile. What else might the designers of The Splendid Sampler throw at me? Whatever it is, I'm up for the challenge and am sure I'll love it! I did it! I finished the pillow sham that matches my Oh My Stars! bedspread. Complete Your Suite Accent Pillow Pattern -- This is for a 20-inch pillow and I use this pattern all of the time! I have more Bobbins and Bits fabrics to use and can't wait to add to my bedroom decoration! I'm so excited to have time to work on my Splendid Sampler blocks this summer! It was difficult finishing this block because I was so busy petting my Meadowbloom fabrics from April Rosenthal. Aren't they gorgeous? 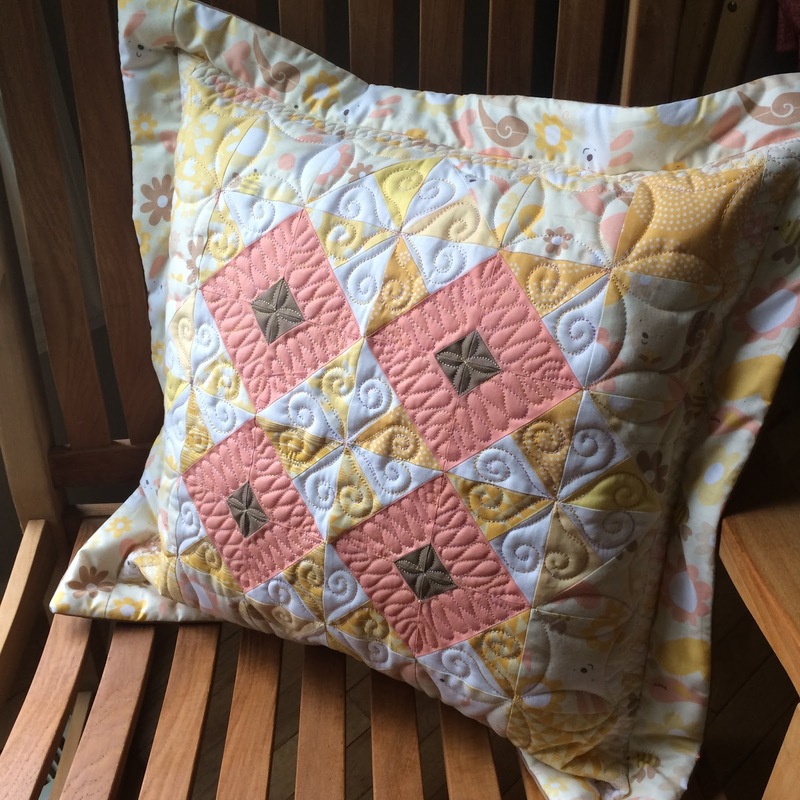 Do you like the quilting on this pillow? I filmed a short tutorial about the machine quilting HERE. I finished a quilt and it is just for me! OK, I'll let super-hubby sleep under it, too, but it's not often I make a "for me" quilt. Most quilts are made and then given away immediately. The pattern is Oh My Stars!, a Cutie Pattern that uses 16 fat-eighths of fabric. I didn't design this, but I wish I had. I've wanted to make this quilt since the moment I laid eyes on the first sample. I finally did! I am filming a how-to YouTube video about the quilting on this quilt. Subscribe to my newsletter so you don't miss any new videos. The fabric is all from the fabulous Pat Sloan. I bought 20 fat quarters from Quilting Possibilities in Forked River, NJ when I taught there last year and added three 2-yard cuts to the collection, figuring that would prepare me for whatever I decided to do. Well, it didn't because there can never be enough Pat Sloan fabric. 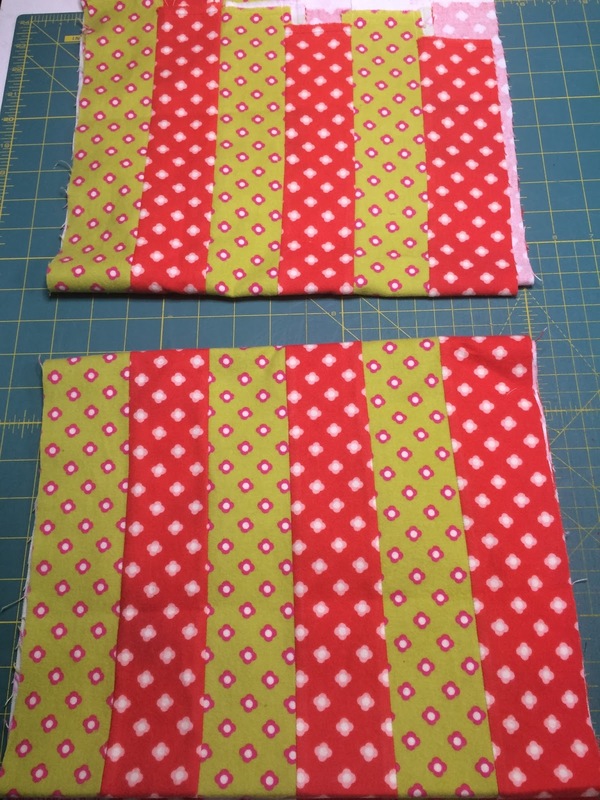 Two yards wasn't enough for the border, so I had to choose two fabrics for the border and I even had to piece them. I piece borders LIKE A BOSS! I pieced this entire top at a SewCation at Sturbridge Quilting and Sewing Center in Massachusetts. Scheduling that quilting weekend was the best idea I ever had!!! A lot of the quilters who attend are locals, but I booked an inexpensive hotel nearby and had an absolute blast. I can't wait to go again. Soon, but not soon enough! I have a bunch of fabric left over from this project and am trying to use it all. Expect to see several more projects featuring these Pat Sloan fabrics. I have been watching all of the pretty blocks made by all of the brave quilters and I finally decided to jump back in. 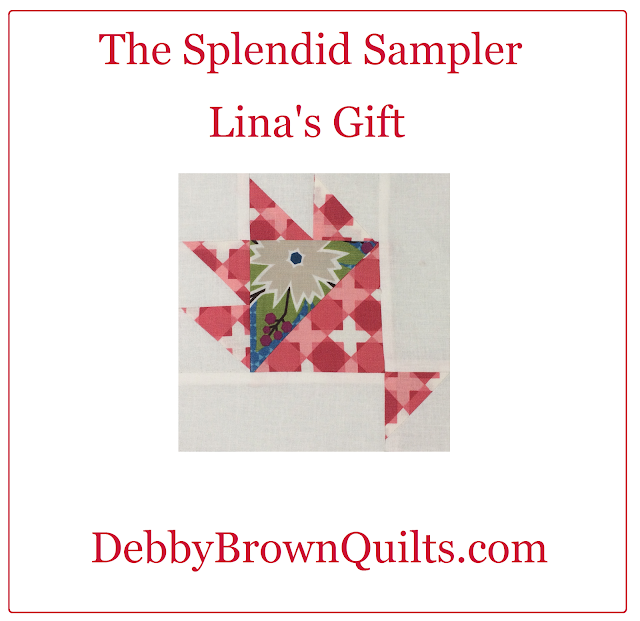 I wanted to start with the current Splendid Sampler block, but I needed to conquer my fear of paper piecing first. I went right back to the Family Affair block by Janice Ryan. 1. I meant for the white and light blue circle fabric to be in the opposite positions. I'm so not ripping this out or starting again. We're just calling it a "design choice" at this point. 2. My four blocks aren't joined perfectly together, but I am leaving them. When I quilt this, I can de-emphasize those seams so... GOOD ENOUGH! I am still a machine quilter and not a paper-piecer, but I survived and will live to paper-piece another Splendid Sampler block in the future. Yes, I did use both Star Wars and Star Trek references in the same paragraph. Sue me.